How does the Nikon D850’s film digitizer mode work? One of the less-publicized - but also very neat - features of the new Nikon D850 is its "Negative Digitizer Mode." In fact, it isn't until page 85 of Nikon USA's official D850 brochure that we find any discussion of the feature. So no, it is not a big deal for most users, but for D850 who still have film images that they want to convert into digital data, this is an outstanding feature. With its 45-megapixel full-frame sensor, the D850 is well-equipped to turn your negative film into positive digital data. 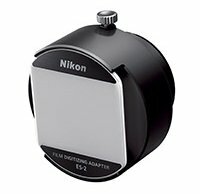 You need the optional ES-2 Film Digitizing Adapter, a compatible lens, such as Nikon's AF-S Micro Nikkor 60mm f/2.8G ED, and an FH-4 Strip Film Holder or FH-5 Slide Mount Holder, which come in the ES-2 kit linked above but are also available separately. When you've got the necessary equipment, you're good to go. The camera's built-in digitizing function automatically reverses the colors and stores large JPEG Fine files. You can even display the images on a monitor as you digitize them if your D850 is connected via HDMI. Tokyo-based photographer Richard Haw has gone hands-on with the new D850 and he has used its new negative digitizer functionality. You can read about his experience here.